The safety industry as a whole does a good job of reducing its recordable injury rates and lost-time incident and injury severity rates. However, while these are worth recognition, there still are many leaders and employees that still believe that reducing recordable injury rates, they are reducing the chances of fatalities or other major losses occurring. In fact, the statistics of an employee dying on the job are 1: 30,000 in 12 months and of those who will be injured 1: 10,000 in the same amount of time. Developing a process for major loss preventions should involve the company as a whole, and safety professionals recognize this. Safety leadership would be a lot easier if there were simple answers to the source(s) and cause(s) of major losses. The causes of major loss may be complex. Factors include: the way the equipment in the facility is designed and installed, inadvertent and/or invalid assumptions, practices and paradigms held by the workers, and they may even be rooted in the organizations culture. Will the current safety managements system and processes truly prevent disabling injury, major property loss and fatalities? 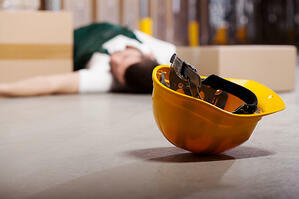 Are all the safety processes and tools available to identify workplace hazards? Most safety professionals realize there is no single method or set of methods that will identify hazards 100% accurately. It is safety leader's jobs to look beyond the status quo and embrace the changes that must be made. Preventing a major loss, or PML for short, is a process that requires an active approach to understanding how to allocate limited resources. In order to identify hazards use basic loss causation models like PEME (Pre-Employment Medical Exam) and understand the relationships between the different factors. Regardless of how perfect a plan is, it is crucial to factor in human error. Understanding the Reason Why Losses Occurred. These observations and findings should be based on actual operating practices and conditions. It is also important to consider the safety culture of the organization, whether they are reactive, proactive, calculative or generative. In applying hierarchy of controls, team members must consider the effectiveness of controls at each level of control, including proper PPE, engineering and administrative controls, and eliminating the hazard. It is important to identify the cause of each major loss even if it is difficult. There are 11 trigger groups that are entailed in PML. Assessing and Taking the Necessary Course of Action. Finding out what is the problem is not the complete solution, it is necessary to assess the corrective actions needed to avoid incidents in the future.